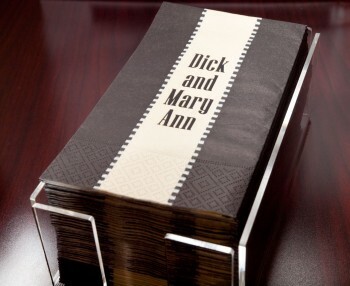 DeVille napkins and guest towels are our most upscale disposable napkins available. These are the heaviest weight of all of our personalized napkins and are great for heavy duty meals and powder rooms. These special napkins are available in a beverage/cocktail size and a 1/8 dinner fold or guest towel size only. This size is somewhat larger than a typical dinner napkin/guest towel (see product specs below). Personalized DeVille Napkins and Guest Towels are only available in two sizes in white only with low minimums starting at quantities of 50. Pricing includes up to 3 lines of copy including art and 1 color imprint. There is no extra set-up fee and no PMS (Pantone) color matching charge. Printer’s proofs are available for $15 and typically add 2-4 days to productions time. Proofs are not recommended for rush orders. There is a one time $75 charge for customer supplied art (custom monograms, logos, corporate logos). Regular Printing/Production time is 7 business days INHOUSE plus UPS Ground shipping. 2, 3, and 4 Business Day INHOUSE Rush Printing/Production is available in addition to expedited shipping (PLEASE include a date needed on your order where applicable). Acrylic holders are available for beverage/cocktail, luncheon and guest towel sizes. Made and printed in the USA and recyclable. SEE RELATED PRODUCTS BELOW TO ORDER ACRYLIC HOLDERS FOR NAPKINS AND GUEST TOWELS. See accordions below for pricing, available sizes and colors and detailed product information. INHOUSE PRODUCTION or PRINTING TIME is the time it takes us to process your order upon receipt, print your order, and prepare your order for shipping out of our production facility. You will select your production time when you select your Personalization Options. SHIPPING TIME is the transit time it takes for our shipper to deliver your order to your door after it leaves our facility. You will select your shipping/transit time method at checkout. NOTE: PRE-PRINTED ITEMS AND ACCESSORIES ARE NOT INCLUDED IN THE ABOVE TURNAROUND TIMES; these items typically ship in 2-3 BUSINESS DAYS depending on stock availability and seasonal demand. A black and white pdf Printer’s Proof may be ordered when you select you Personalization Options. This is an exact replication of what is to be printed on your item. This proof is usually emailed within 2-3 BUSINESS days of placing the order depending on the time of the year. Proofs typically add 2-4 BUSINESS days to INHOUSE PROUDCTION/PRINTING TIME. INHOUSE PRODUCTION/PRINTING TIME does not begin until we have received the FINAL proof approval so we do not recommend selecting a proof for RUSH ORDERS unless you have factored in this additional time. Once the proof is approved, the customer takes responsibility of the correctness of the order. Calculation of actual shipping cost will be made at checkout. Shipping cost is calculated in real time based on the items ordered and the shipping zip code. WE DO NOT SHIP TO PR or CANADA. Please use this map to calculate UPS Ground shipping/transit time from our production plant in Dallas, TX. PLEASE NOTE UPS DOES NOT DELIVER GROUND SHIPMENTS ON SATURDAYS. UPS DOES NOT deliver to post office boxes. If may be necessary to select RUSH PRINTING in ADDITION to expedited SHIPPING to meet your date needed. WE REQUEST THAT YOU ENTER A DATE NEEDED ON EVERY ORDER. If you have selected a printing and shipping method that will not allow us to meet your specified date needed we will contact you to expedite the order further. We assume full responsibility for your order being printed in the selected production time, however, UPS does not unconditionally guarantee delivery time and neither can we. Once your order has been processed, printed, packaged and picked up from our production facility by UPS, delivery of your order is the sole responsibility of UPS. Cup of Arms is not liable or responsible for lost, damaged, late, or undelivered packages. Should your order be lost, damaged, or undelivered, you should contact UPS immediately at 1-800-PICKUPS (800-742-5877) to initiate a claim, or visit their web site at http://www.ups.com. Cup of Arms will assist in any manner possible to help you with any claim through UPS. Perils of the air, public enemies, criminal acts of any person(s) or entities, including, but not limited to, acts of terrorism, public authorities acting with actual or apparent authority, authority of law, local disputes, civil commotion, hazards incident to a state of war, local or national weather conditions, national or local disruptions in air or ground transportation networks (as determined solely by us), strikes or anticipated strikes (of any entity, including, but not limited to, other carriers, vendors or suppliers), labor disruptions or shortages caused by pandemic conditions or other public health event or circumstances, natural disasters (earthquakes, floods and hurricanes are examples of natural disasters), conditions that present a danger to our personnel, and disruption or failure of communication and information systems (including, but not limited to, our systems). When placing your order please double check the shipping address information you have entered for errors, typos or misspellings, before submitting your order. Submitting any part of your shipping information incorrectly can result in delivery delays of up to 1 additional day as well as additional costs for UPS to reroute and correct the address. What type, size and quantity of napkins and guest towels should I order? We offer 7 different types of napkins in addition to a wide selection of everyday patterned napkins and holiday patterned napkins. Not all napkins types are offered in all sizes and colors so please take this into consideration when selecting your napkin type. We always recommend checking with your event planner, caterer, or your specific party venue prior to ordering any party goods. These people know your menu, your theme and your venue and will have a better idea of what type of napkin, what size napkin and the quantity that you need. If these experts aren’t available, we offer the following general guidelines below. 3-PLY: The traditional personalized napkin perfect for any occasion. These napkins are the better party store type napkins constructed from soft 3-ply premium material with a coin embossed edge. By far our most popular wedding reception and party napkin. These come in a wide variety of colors and ink colors may be matched to napkin color to use on cups, coasters, stir sticks or any of our imprintable items. LINUN: These are a heavier weight than our 3-Ply napkins and resemble more of a heavy weight very nice paper towel than a typical napkin. Linun napkins and guest towels have a beautiful texture (that resembles actual linen) and have a more elegant yet sturdy feel than the 3-Ply napkin. They do not have the a coin edge border like our 3-Ply napkins. These are our top-tier solid color napkins and they are great for messy outdoor dinners, crawfish boils, barbecues, lobster roasts and other events where more absorbency is needed. They are available in a wide variety of solid colors and ink colors may be matched to the napkin color to use on any of our imprintable items. MOIRE: A tissue soft 3-Ply napkin with an elegant moiré pattern tone on tone finish. The moiré finish mimics beautiful silk moiré fabric and has a “wavy” or watery appearance with a slight sheen with a sophisticated pin dot border. These make a gorgeous addition to a more formal event such as an anniversary party or christening or just add a sparkle to cocktails on the beach. CARTE: These napkins are imported from Germany and are quite spectacular. The napkin itself has an elegant blind embossed texture in a beautiful Old World pattern with a slight sheen. Personalization/printing is done on top of the embossed napkin. These gorgeous personalized napkins always make an impression. SOFT AIRLAID: These napkins are bulky, porous and “soft” as the name refers! This is one of the most absorbent and strongest napkins we offer. They are the ideal replacement for linen napkins for events that require something strong and durable such as barbecues/ribs, seafood and hamburgers. Also one of our most popular guest towels for the powder room due to their absorbency. 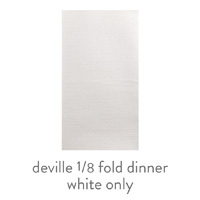 DeVILLE: This is our most upscale disposable napkin available. The heaviest of all of our personalized napkins. Great for heavy duty meals and powder rooms. MASSLINN: This is what we refer to as our country club napkin. Made from 100% rayon fibers these napkins are extremely soft and luxurious. Masslinn napkins are perfect for powder rooms and private clubs requiring only the best. Due to the nature of the fiber these are only available imprinted in gold, silver, or copper metallic foil inks. *A separate dinner and guest towel size are not offered in all napkin types but these are interchangeable. A traditional size guest towel may be used for a dinner napkin and looks very nice when used in a place setting. We do not recommend large size dinner napkins when events are not seated; these are cumbersome to juggle with a drink and a plate while standing! 1.5 per guest if linen or cloth napkins are not being used; more for messier events! GUEST TOWELS: These may be used in the powder room or designer port-a-trailers to prevent the spread of germs by repeatedly using the same linen cloth towel to dry hands on and may also be used at a place setting for a dinner napkin. For information on ordering PRODUCT SAMPLES click here. DB Beverage 5.0" 5.0" 3.75" x 2.50" 3.75" x 3.75"
DD Dinner 1/8 4.25" 8.5" 3.25" x 2.50" 3.25" x 4.75"
* Napkins sizes are approximate and may vary slightly. Cup of Arms offers a huge array of Personalization Options including our Signature Collection of monograms, name, and design styles that were created exclusively for Cup of Arms. You may view all of our ink colors, typestyles, Signature and Custom Collection monogram and design styles, stock art, borders, enhancers, frames and napkin print placement options here. (Please be patient; the PERSONALIZATION OPTIONS page may take a few minutes to load due to the number of custom options we offer). This link is for VIEWING our personalization options only; you will select your personalization options, choose your design layout, and enter your personalization details after selecting your specific product above and clicking on PERSONALIZE & BUY. Clicking on PERSONALIZE & BUY after choosing your product will activate the Personalization Options selection process. All of our items may be printed with customer supplied art. We highly recommend that you email us your art PRIOR to placing your order to determine if your art is acceptable. There is a one time ONLY $75 charge for submitting custom art. If the SAME art is used on two different sides of an item, there is only ONE $75 charge. If one piece of art is submitted for side one and a DIFFERENT piece of art is submitted for side two, there are TWO $75 charges ($150 total). After your artwork is submitted for your first initial order, the art is kept on file and may be used on any future order free of charge. Please follow the instructions below for submitting and labeling your art so it may be easily located for subsequent orders. Customer supplied art must be received by 12:00 CST to be considered that day’s order. If artwork submitted must be altered, edited or resubmitted, the order will be placed on hold until art is resubmitted in an acceptable format. Please note that selected in-house printing/production time on the order does not begin until acceptable artwork suitable for printing is received. We request that art is submitted as camera ready. Camera ready art is defined as black and white high contrast art with sharp clean lines that requires no touch up or alterations to print in a high quality. Poor quality art will produce poor quality printing. A fax, Word document, photocopy, business card, photograph of the art, or a sketch is not considered high quality art. Art with halftones, gradients or screens is not acceptable; gradients and screens are considered a second color even if in the same originating color. An EPS file format created in a vector drawing program is preferred with all graphics represented as lines, outlines or fills and fonts converted to graphics or outlines. Acceptable files are Adobe Illustrator (.ai), Corel Draw (.cdr) and Adobe (.pdf) preferably saved in .eps format. High-Resolution JPEG files are usually acceptable but all artwork must be a minimum of 300dpi resolution at the finished print size. For digital full color printing 4-color process artwork should be converted to CMYK and sent as either a TIFF or PDF file. Please save your art with a file name that includes the order number and last name on the order to easily link the artwork with the appropriate order and to aid in locating the art for future orders. PLEASE INCLUDE IN THE FILE NAME IF ART IS TO BE USED FOR SIDE 1 or SIDE 2. If using a custom PMS (Pantone Matching System) ink color, please include the PMS color in your email or in the art file. Cups of Arms does not charge for custom PMS (Pantone Matching System) matching, however, color match is only guaranteed plus or minus one color shade on white or clear items. We cannot guarantee color match on colored items. We will make every effort to obtain as close of a printed match to the requested color on orders requesting a PMS color on a colored item, however we are not responsible for shade variations. If art submitted is determined to be unacceptable for printing, our Art Department may be able to alter the art to correct it. Converting art that is not camera ready will be charged at an hourly rate of $50 per hour with a one hour minimum. Additional art charges, where necessary, will be quoted and must be approved prior to beginning the work. Most art can be converted within our minimum one hour art rate. Orders will be placed on hold until acceptable art is created and approved or re-submitted. SELECTED PRINTING/PRODUCTION TIME DOES NOT BEGIN UNTIL ACCEPTABLE ARTWORK IS RECEIVED or APPROVED. Select your product first and click on PERSONALIZE & BUY. When selecting your Personalization Options, select an ink color or enter a custom PMS color. Check this box if you are sending us NEW art that has never been used by Cup of Arms or Paper House Online on a previous order. Check this box if you are using art that is on file with us and HAS been used by Cup of Arms or Paper House Online on a previous order. Repeat for Side 2 if custom art is being used on side 2. Add any additional personalization desired using any or our typestyles or art. After placing your order, EMAIL your custom art AS AN ATTACHMENT to: art@cupofarms.com (customer supplied art is NOT uploadable to our website). Please do not embed your custom art within your email. You will receive an email confirmation that your art has been received within 24 hours. All customer submitted art will be accepted by Cup of Arms as being in full compliance with all applicable laws regarding trademark, licensing, patent, copyright, right of privacy or similar protection. Cup of Arms will be held harmless from all claims and costs arising from these issues. Any logos contained on this site are not for sale and are not an endorsement from their owners, nor do we offer any endorsement of their owners. By placing an order, we reserve the right to use any overruns for digital media, print media and/or product samples illustrating our printing capabilities. When submitted custom art that requires multi-color printing we offer several options. On two sided items that are screen printed, you may select a different color for side one (ex: orange) and side two (ex: blue). We may also print in two colors on the same side of a one-sided item or two-sided item however, we do not guarantee registration between print colors. Artwork requiring close registration between two different print colors on the same side may not be well suited for printing on a short production run as the registration between print colors may vary as much as a 1/16” to 1/8" in any direction. While we attempt to minimize this as much as possible on short run orders, we do not guarantee the registration between print colors. Using two colors of ink entails additional charges depending on the item and the quantity. The additional charge for two-color ink will be made after the order is placed. Please email us for a quote on two-color printing or see the pricing grids for this additional charge. We also offer full color digital printing on white and ivory 3-ply beverage and luncheon napkins, neoprene can huggers, neoprene side-zip bottle huggers and neoprene coasters. For digital full color printing 4-color process artwork should be converted to CMYK and sent as either a TIFF or PDF file. For large runs consisting of quantities of 50,000 or more we are able to print multiple colors on the same side for most of our products. Please contact us for a quote. If you would like to compare pricing for all of our products, you may find full product pricing for all of our products based on product type, size and quantity at the very bottom our of our website using this PRODUCT PRICING link. (To go directly to this information, PRODUCT PRICING may be found at the very bottom of our website, under the far left hand column entitled ORDERS). Shop our NEW curated SIGNATURE COLLECTION of MONOGRAM, INITIAL, NAME, COLLEGIATE and FUN DESIGN STYLES created and designed exclusively for Cup of Arms! View traditional favorites in our CUSTOM COLLECTION as well. We hope you have fun and enjoy designing as much as we have enjoyed creating this collection! You must first SELECT YOUR CUSTOM OPTIONS, then ENTER YOUR PERSONALIZATION and select your line by line layout. Give us special instructions if you wish and be as specific as possible! For typesetting tips, etiquette advice, questions on what size to order, printing and shipping time and other ordering information, see the FAQs. Please contact us if you can't find what you need. We're here to help! You must select a typestyle in the LAYOUT SECTION below when you enter your personalization for the following styles. Combine art with any of our typestyles or by itself to make your design truly custom. SUBMIT NEW CUSTOM ART +$75.00 Please email your art with your order number in the subject line to art@cupofarms.com. (You may not upload art directly to this site; it must be submitted in a separate email after the order is placed.) You will receive email confirmation. Use Custom Art that is on file and has been used by Paper House Online or Cup of Arms on a previous order (no additional charge). Please include previous order number, name, or approximate order date below. *Enter monogram or initial(s) in upper/lower case EXACTLY as you would like them printed. For styles AVAILABLE ONLY AS SHOWN, initials will be printed in either upper or lower case as shown on the sample. * You must select the placement of your design from the line by line dropdown below. * Personalization will be printed EXACTLY as shown for the selected design. You may add additional text above or below the design in the layout section below. All designs, art and text will be centered on your item and sized appropriately to fit the allowable printable space unless otherwise noted in the SPECIAL INSTRUCTIONS box. We welcome any notes or instructions that may help us ensure that we print your order exactly as you have envisioned it. Please feel free to include instructions regarding placement, sizing, or other details that may assist us. WE HIGHLY RECOMMEND ORDERING A PRINTER'S PROOF ($15) PRIOR TO PRINTING if you are concerned about your special request(s) not being interpreted. (PRINTER'S PROOFS ARE NOT RECOMMENDED FOR RUSH PRINTING). If you require a special placement that is not listed here, please describe placement in the Special Instructions box. ONE COLOR PRINTING is included in base product price. SECOND COLOR PRINTING may be added for an additional charge BELOW. For TWO COLOR PRINTING, select first color by clicking on it here, then scroll down and TYPE the name of your second ink color in the box provided. Explain VERY SPECIFICALLY what is to be printed in what color. FULL, MULTIPLE COLOR PRINTING is included in base product price of DIGITAL FULL COLOR products. For DIGITAL FULL COLOR ITEMS, select main print color for your Digital Full Color product by clicking on it here and use the SPECIAL INSTRUCTIONS box in the LAYOUT SECTION above to explain very specifically what your full color requirements are. CUSTOM PMS colors incur no additional charge; please enter the specific PMS number in the field provided. We offer both INK and FOIL printing. Foil printing is opaque and foil must be used when printing a LIGHTER color ink on a DARKER color paper product for coverage purposes (for example WHITE print on a FOREST GREEN NAPKIN must be printed in opaque FOIL). Matches, playing cards and ribbon must be printed in FOIL(*) colors. Masslinn Napkins may ONLY be printed in GOLD, SILVER, or COPPER METALLIC FOIL. May be used for hot stamping only on all types of napkins, pulpboard coasters, wooden stir sticks,matches, playing cards and ribbon only. Foil may not be used on plastics. Masslinn napkins printed in gold, silver or copper metallic only. Please note: Foil creates a more beautiful and dramatic look, however, it may have a tendency to bleed, rub off, fill in, or blur slightly. Foil imprinting is hot stamped onto the product rather than absorbing into the product like traditional ink printing. The foil printed portion of a product is therefore intended for presentation only and should not be used to wipe hands or face and may flake or rub off on another surface. This is the nature of foil hot stamping and is not considered a defect. All computer monitors are different. These color swatches are meant to be representative only of the color shown. For specific PMS color matching, please provide a specific PMS (Pantone) color number. You can view a Pantone Color Chart here. TWO COLOR PRINTING is limited to two print colors PER ITEM. For any two-sided product, we can print SIDE 1 in one print color and SIDE 2 in a second print color. NEW: For any ONE-SIDED or TWO-SIDED product, we can now print TWO PRINT COLORS on the SAME SIDE of your item if the registration of your design or layout allows. Select your FIRST ink color by clicking on the color above. I would like SIDE TWO printed in the SECOND INK COLOR. Two color printing ONLY on SIDE ONE. Two color printing ONLY on SIDE TWO. Two color printing on SIDE ONE AND SIDE TWO. An emailed black and white pdf printer's proof is generated by our professional typesetters and is an exact replication of what will be printed on your order. Proofs are typically sent within 48 hours of receipt of your order Mon-Fri. They may take longer during high production times. Proofs typically add 2-4 days to production time. WE DO NOT RECOMMEND PROOFS FOR RUSH ORDERS AS SELECTED PRINTING TIME DOES NOT BEGIN UNTIL THE PROOF APPROVAL IS RECIEVED. We recommend checking your spam for proofs that may not have been received within this time frame. Once a proof is approved, the customer takes full responsibility for the correctness of the order. Once an item is added to the cart changes MAY NOT BE MADE. You must start over to make a change to your personalization options so please check your design, personalization, typestyle, layout and print color CAREFULLY before adding to the cart. YES! We can accommodate your date needed! Regular printing/inhouse turnaround time is 7 BUSINESS DAYS. We also offer 2 BUSINESS DAYS (+$40), 3 BUSINESS DAYS (+$30), and 4 BUSINESS DAYS (+$20) RUSH PRINTING options along with expedited shipping which may be added during checkout. Please see TURNAROUND TIME for a complete description of our printing and shipping options as well as UPS shipping map to determine delivery time. My personalization is complete and I have checked my order. PLEASE NOTE: Once an item is added to the cart, changes may only be made to quantities, not personalization options. You must start over to make a change to personalization. Please check color, design, personalization, layout, spelling, punctuation and capitalization before adding your personalized item to the cart.